Our clients are always asking how to maintain their manicure at home, with many other questions flowing too. Hopefully I can give a little insight and help to extend the life of your manicure, amongst other tips and advice. Jessicas natural nails are known for their signature quality. Colours glide on like silk, looking fresh for up to two weeks. To help maximize the life of every manicure, always use Jessica homecare maintainance products. 1. 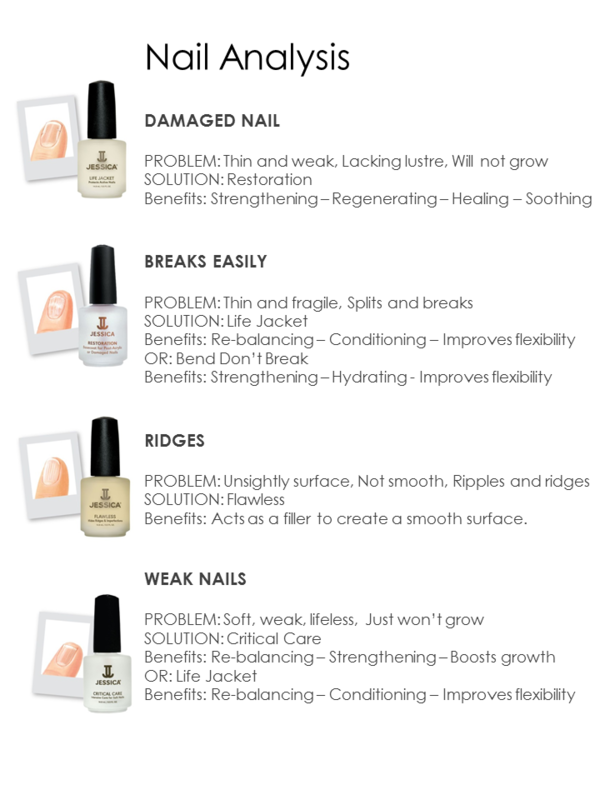 Protect your nails! The day after your manicure apply one coat of Brillance over the nail. Remember to seal the edges!! 2. Every night massage phenomen oil into the cuitcles, to promote growth and as an intensive moisturiser. 3. Everyday massage the cuticle area with Nourish, to help condition and stimulate nail growth. 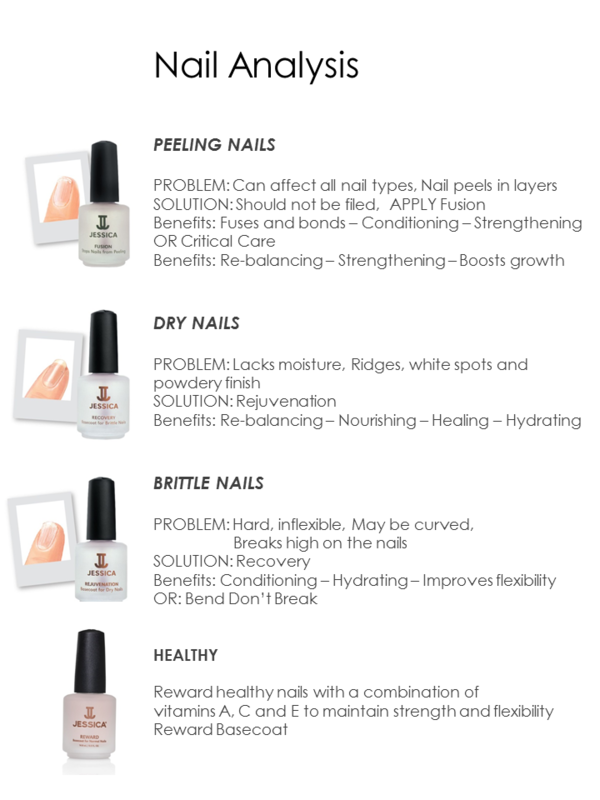 Nail growth begins at the cuticle, so with proper cuticle care, you'll encourage healthy nails. The treatments will keep your cuticles soft and help healthy nail growth while the massage action will stimulate growth. 4. Evey 3-4 days after your Jessica manicure, re-apply one coat of colour, along with Brillance High Gloss. To finish a drop of quick dry, or spray of speed dry nail polish dryer, will help protect against smudging. * Never soak hands in poish remover - it dries out the nail.Try to follow the 'how to' so you will only be removing polish every 2-3weeks. *Remove polish with Jessica remover. Stroke down the outer edge in towards the centre of each nail. *Keep the skin around your nails moisturised. This helps prevent hangnails. *Its an old wives tale that nails need to breathe, keep them polished keeps them protected. *Nails should be trimmed once a month to promote growth. Avoid scissors, use nail clippers. *File by stroking the nail gently in long strokes, at 45 degree angle. Bevel down to finish. Avoid a fast see- saw action, as will cause heat and friction, thus drying out the nail. *Don't use polish remover to thin out nail polish. If necessary apply basecoat to nail polish. So how can you make your nail polish last longer, when at home? Clean bottle necks regularly to ensure an airtight seal. We have such a fabulous range of colours which look amazing on our shelf, but how do you find a colour to suit you? Remember you can always ask us for advice, together we can experiment with an array of colours to find which are best for you. The picture above are the New Autumn colours from Jessica, you can keep updated if you follow us on Instagram and Facebook, where we can load more info and pictures for you.